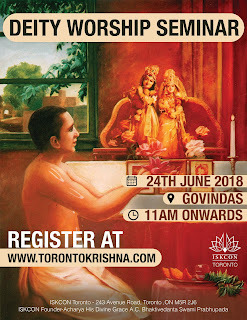 **REGISTRATION CLOSED** Deity Worship Seminar - June 24, 2018 ~ The Toronto Hare Krishna Temple! As devotees of Krishna, have you aspired to transform your home into a small temple for God? 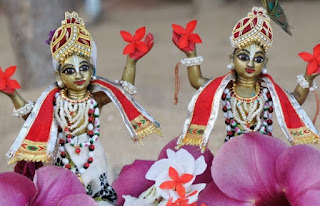 Have you ever desired to perform personal service to Deities? Are you not sure how to do so authentically? The Hare Krishna Temple is organizing an all-day seminar on Deity Worship with Bhakti Yoga Dasa. Our sacred texts reveal that God has an authorized representation in the Deity form, which is called arcā-vigraha. This arcā-vigraha is an incarnation of the Supreme Lord. Lord Krishna will accept service through that form. The Lord is omnipotent, all-powerful; therefore, by His incarnation as arcā-vigraha, He can accept the services of the devotee. Click Here to Register for the Seminar!